Low Sugar Sweet Potato Casserole. Gluten free vegan comfort food that tastes just like the holidays. Go grab a spoon, you’re gonna love it! Place sweet potatoes on baking sheet and massage 1 tablespoon coconut oil and 1/2 teaspoon cinnamon on sweet potatoes; roast for 30 minutes. Once sweet potatoes finish roasting, add them to mixing bowl along with remaining coconut oil and cinnamon, maple syrup, vanilla, and salt; whip ingredients together with electric mixer until smooth. 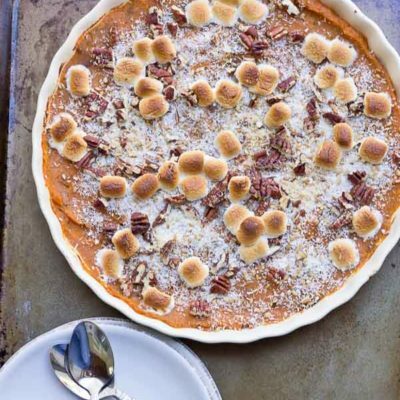 Pour sweet potato mixture in baking dish and top with flaxseed, pecans, coconut, and marshmallows. Bake for 10 minutes until marshmallows are toasted.